Is There A Double Standard When Female CEOs In Tech Stumble? 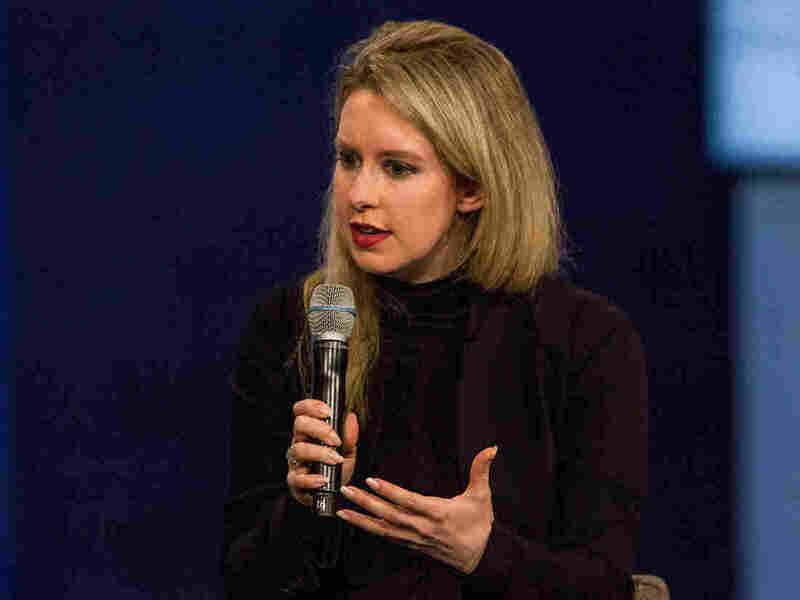 : All Tech Considered Male CEOs fail all the time, but when someone like Yahoo's Marissa Mayer or Theranos' Elizabeth Holmes falls short of expectations it can feed stereotypes about women being unfit for leadership. Elizabeth Holmes, founder and CEO of Theranos, speaks at the Clinton Global Initiative's closing session Sept. 29, 2015, in New York City. Two of the highest profile women in tech have had a tough year. Marissa Mayer, the CEO of Yahoo, saw her company sold to Verizon. Elizabeth Holmes, the founder of the experimental blood testing company Theranos, was banned from her own labs by regulators for two years. Though male founders and CEOs fail all the time, it may have different implications when women mess up, says Marianne Cooper, a sociologist at the Clayman Institute for Gender Research at Stanford University. "There are so many other male leaders that ... failure doesn't really create expectations about other men's leadership capacities or capabilities," she says. When former Enron CEO Kenneth Lay was indicted for securities fraud or Angelo Mozilo, the former chairman of Countrywide Financial, was associated with bringing on the housing crisis nobody suggested it was because they were men. Because there are so few female CEOs, especially in tech, Cooper says when a Marissa Mayer or Elizabeth Holmes fails it can feed stereotypes. "It not only can damage her career just individually for herself," says Cooper, "but it can actually serve to reconfirm broader cultural beliefs that are out there that women aren't quite the right fit for senior leadership or certain kinds of senior leadership positions." Cooper says there are studies that show that when women and men go to funders with the same idea, women are less likely to get backing. Yahoo President and CEO Marissa Mayer delivers a keynote during the Yahoo Mobile Developers Conference on Feb. 18, in San Francisco. And with the timing of failures by Mayer and Holmes so close, some people do lump them together despite their very different career trajectories. If you read the comments below articles online, both women are the targets of stinging sexism. A recent post on NPR's site said of Mayer's failure — "simply evidence that women cannot lead." A post on news comment site Reddit — called both women part of the "the feminist industrial complex" that promotes unqualified women. Despite other successful CEOs in tech, as young, attractive, rising stars Mayer and Holmes became media darlings. Holmes was fashioned as a great female visionary of the tech world. Last year, Time magazine put her on the list of its 100 most influential people. Holmes' penchant for wearing black turtlenecks evoked comparisons to Steve Jobs, who also wore them. Mayer became a symbol of a woman CEO who could juggle her job and giving birth to twins. She appeared on television shows talking about the experience. 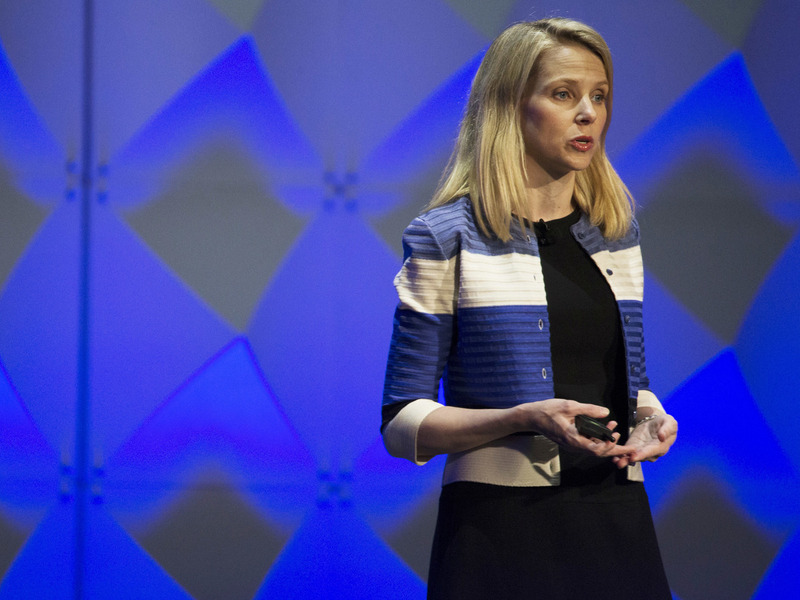 Many female executives in the tech world still prefer to see Mayer as a role model. "I think certainly Marissa going in as a CEO who was having a child has shown that you can do both of those things at once. And just having a woman be in that role is normalizing for the rest of us," says Natala Menezes, who has been an executive at Amazon, Microsoft and Google and is currently a general manager at the marketing and analytics firm Localytics. Minnie Ingersoll, the chief operating officer and co-founder of Shift, a startup that helps people sell used cars online, likes to see women shoot for the stars. "One message for young women is that it's OK to take a big risk and to fail," she says. "I think there's something actually for me personally that I find almost inspiring in someone who is willing to take that risk." But she doesn't think Mayer and Holmes have much in common. "Marissa and Elizabeth are both blond women. But other than that, I see what is going on in their careers very differently," Ingersoll says. Though being young and blond may have something to do with the media's fascination with these women, there are others succeeding as leaders in tech. Ursula Burns runs Xerox. Meg Whitman now runs HP enterprise — and as the former CEO of eBay she helped turn the company into a giant of online commerce. Ginni Rometty is CEO of IBM. Menezes and Ingersoll hope that their successes will make it easier for women to succeed and dream so big that they can afford to fail as often as men do.